Friday’s Prospective Plantings report will provide the first blush of the potential 2019 acreage mix for spring crops. It also sets the tone for production potential as we move into planting season, says Todd Hubbs, University of Illinois agricultural economist. So far, acreage estimates point to corn returning to the top spot. At its annual Agricultural Outlook Forum in late February, USDA forecast U.S. farmers will plant 92 million acres of corn, which is a 3.3% jump from last year, and 85 million acres of soybeans, which is down 4.7% from last year. Heading into Friday’s report, the trade estimates call for corn acreage to come in at 91.3 million, soybeans at 86.2 million acres and wheat at 46.9 million acres. Combine that with the flooding across major row-crop producing states, a rough winter for fieldwork and high fertilizer costs—and the crystal ball becomes even cloudier. Current USDA projections for corn, soybeans and wheat show 224 million acres planted, Hubbs notes. That’s the lower than the previous three years and compares to 226.1 million acres dedicated to the top three crops in 2018. 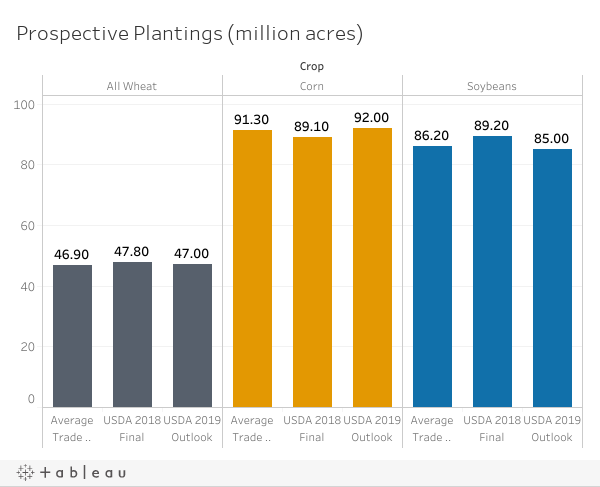 “The lower acreage estimate implies either a drop in principal crop acreage or an increase in acreage for other crops in 2019,” Hubbs says. Cotton, spring wheat and durum wheat are likely to grab some acres from corn and soybeans, Hubbs predicts, as winter wheat acres sit at 31.3 million acres, which is 1.24 million acres lower than a year ago. Cotton looks to compete with soybean acreage in the Mid-South region, taking acres that were dedicated to soybeans last year. But, as always, Mother Nature will have the final say. Some acres may not be planted at all, as the stage is set for record flooding from now through May. In 2018, prevented planted acres totaled only 1.9 million acres, which is down from 2017’s 2.6 million acres, 2016’s 3.4 million acres and 2015’s 6.7 million acres. What Would it Take to Bump Prices? For Friday’s report, Hubbs is predicting 91.8 million acres of corn and 85.7 million acres of soybeans. Hubbs is most nervous about soybean acres. USDA will release its 2019 Prospective Plantings report at 11 a.m. CDT on Friday, March 29. Hubbs will present a webinar on March 29 at 2 p.m., to discuss the implications for corn and soybean prices after USDA’s Grain Stocks and Prospective Plantings reports. Register now. Read more from Hubbs at farmdocdaily.illinois.edu. Prospective Plantings: High-Water Mark for Corn?